Sometimes eating locally does not benefit the health of our bodies or of the planet. Take one of the southeast’s most famous crops, for example: peaches. The official state fruit of Georgia, and state tree of Alabama, peaches are strongly associated with Dixie and with the triumphant guitar riffs of a great band formed in 1969 in Macon, Georgia. The sweet juice of a Georgia peach dripping down the chin becomes a vivid childhood memory of summer, even for a Vermonter. 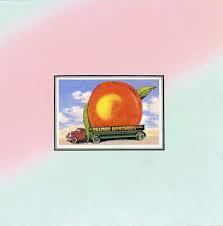 However, with all due respect to the Allman Brothers, my advice is: don’t eat a peach. Along with those happy images in their aura, peaches are also strongly associated with chemicals such as organophosphorous, a neurotoxin, and dichloropropene, a reproductive and developmental toxin—to name just two of the forty-nine chemicals typically sprayed on peaches to ward off everything from nematodes and fungi to large mammals. Needless to say, peaches regularly top the “Dirty Dozen” list of foods most contaminated with pesticide residues. Legions of living things are attracted to the sweet, juicy, bright orange peachiness of the peach, as we humans are, but it is possible to grow them without heavy applications of synthetic nastiness. Unfortunately for me here in Auburn, however, typing “organic peaches Alabama” or “Georgia” into Google yields no sources. Should I make an exception, in order to support local agriculture? Well, not this time. Because the news gets worse. * Known or probable carcinogens, as designated by the International Agency for Research on Cancer (IARC), U.S. EPA, U.S. National Toxicology Program, and the state of California’s Proposition 65 list. * Reproductive or developmental toxicants, as designated by the state of California’s Proposition 65 list. * Neurotoxic cholinesterase inhibitors, as designated by California Department of Pesticide Regulation, the Materials Safety Data Sheet for the particular chemical, or PAN staff evaluation of chemical structure (for organophosphorus compounds). * Known groundwater contaminants, as designated by the state of California (for actively registered pesticides) or from historic groundwater monitoring records (for banned pesticides). * Pesticides with high acute toxicity, as designated by the World Health Organization (WHO), the U.S. EPA, or the U.S. National Toxicology Program. Yikes, I don’t know if I will ever be able to eat a peach again without a little twinge of knowing too much. I will wait until July when Kildeer Farm will have some local organic peaches and satiate my taste buds then. Waiting in Vermont where it is still unseasonably chilly and gray. Thanks so much for this informative post – my 19 month old is a fruit-a-holic. Now I know to strike peaches off the grocery list, unless they’re organic of course!